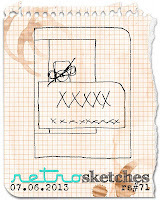 Here to post a card i made according to the Retro Sketch. I dont usually follow any sketch, but decided to give it a try. Also took the colours from Dynamic Duos, green n yellow. Decided to use PP scraps, it was real fun doing the sketch and the card was completed in no time. The roses are from an old flower vase. I have been hoarding it for nearly 4 yrs. Good that it has come of use. Do tell me ur views dear friends. See you soon with another card, till then happy crafting. hey girl awesome card with beautiful colors. i think you have tempted me to try the dynamic duo challenge. Great colour combination as well!. Wonderful card Sujana ! Lovely bright colors and the roses look very pretty ! A very lovely and happy card - the colors are perfect together :) Wonderful job! Lovely color combo. Looks just perfect :)..
Fabulous card! I also like the color combo you've used. love the roses. Did you get my gift yet? I sent it past Saturday. Beautiful textures and elements here Sujana. 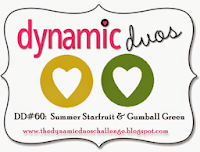 Thank you so much for sharing with us this week at Dyanmic Duos! Beautiful card! REALLY love the flowers and that button detail!